01. Do I need to set up an account to place an order? 02. What should I do if I forgot my password? If you have forgotten your password, visit the ‘My Account’ section, click on ‘Forgot Your Password?’ and simply follow the ‘Password Reset’ instructions. You will receive an email with a new temporary password. 03. Which size should I choose? 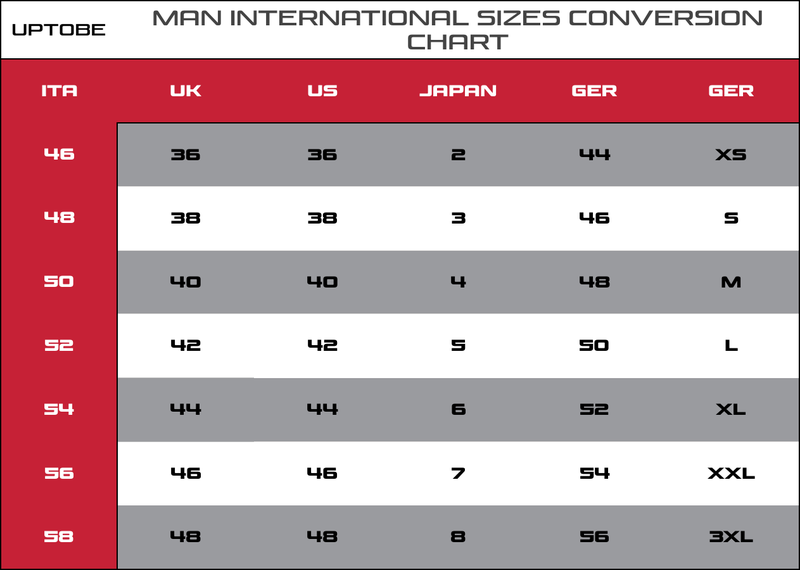 In UPTOBE website, sizes may be based on the Italian sizing system. 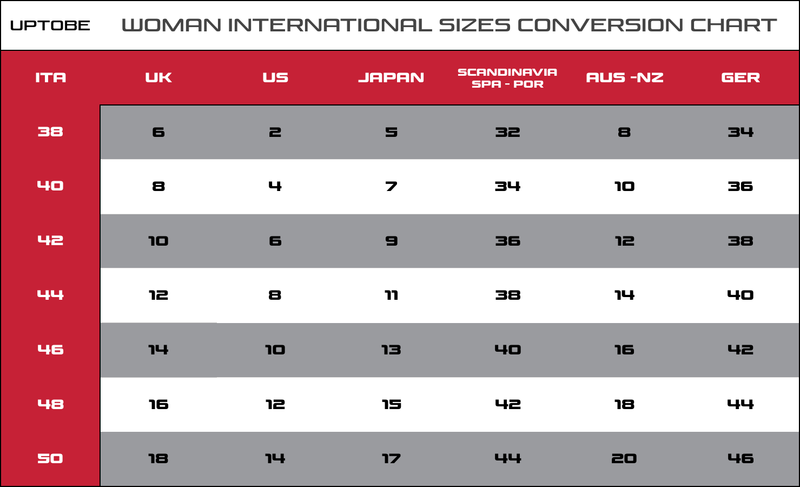 To convert this to your usual size check the conversion table here. 04. Is it safe to use my credit card at the Uptobe online store? We use the latest SSL encryption technology to store and safely transmit your personal data through our systems and we all your payment will go trough PayPal, the safest way to pay on the web. 05. How soon can I get my order and how much delivery will cost? You’ll recieve your order in 3 to 5 days depending on your shipping location and the shipping is on us everywhere. 06. How do I return an item? 07. Is my personal information kept private? 08. What is a Wishlist? In your ‘Wishlist’ you can save your favorite products, keep track of them and eventually purchase them whenever you please. 09. Can I request the invoice for my orders? Of course, when you check out, you will find a link to send the billing request indicating your tax information. If you have already placed your order and forgot to request the invoice, you can contact us HERE by 10.00 a.m. the next day. Did we not solve your question? Contact our support team !